Like its predecessor, the G2 is controlled by very DSP-light front-end software, all the synthesis calculations taking place in the hardware keyboard. When I first encountered the Nord Modular, it seemed to herald an exciting new era in synthesizer design. 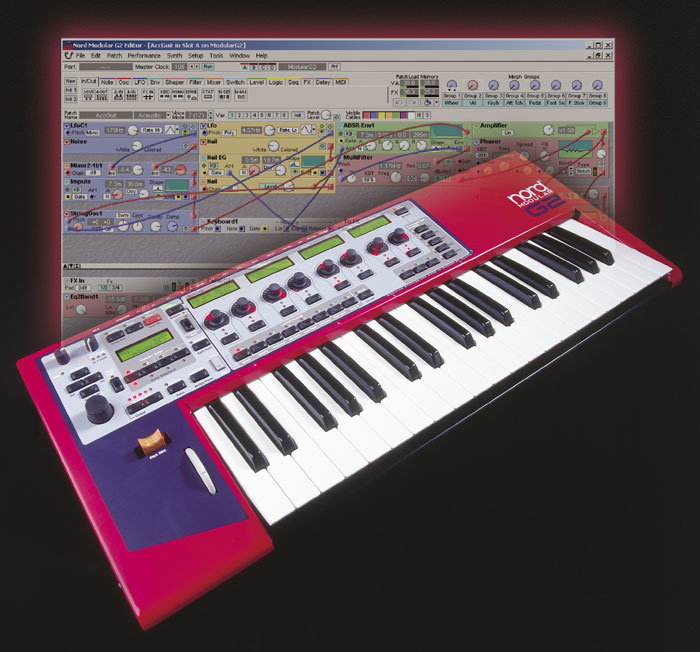 In 1998, it was a brave and innovative step to offer an affordable synth system which used drag-and-drop-based software to construct its patches while leaving the synthesis to the DSP in the accompanying controller keyboard. 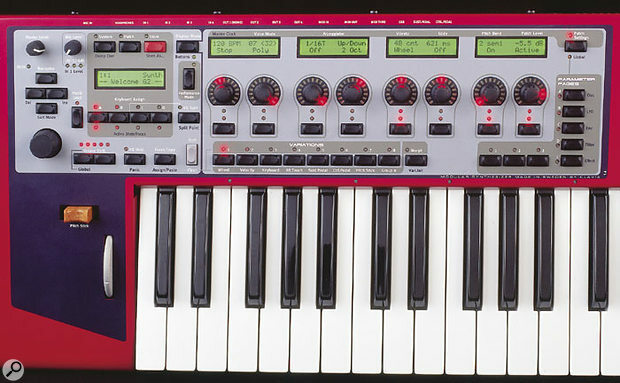 However, rather than take up the challenge, the majority of hardware synth manufacturers steered clear of this concept, until computers became powerful enough to start running synthesis software unaided by external DSP. Since then, most of the innovation in synth design has been in software-only instruments, with one or two notable recent exceptions, like Hartmann's Neuron or Roland's V-Synth. Undaunted by this, Clavia have decided to demonstrate their faith in their part-hardware, part-software approach to synthesis, and have forged ahead with a 'second-generation' Nord Modular, the G2. This is just as well, as the 1998 Modular is now looking rather long in the tooth compared to some of 2004's software-only synths. The G2 therefore represents an opportunity for Clavia to bring their Modular concept up to date for sound designers, but of course with its hardware keyboard, it also has advantages to offer over software for live performers. It could be a dream instrument for both programmers and performers — so how does it fare? Although there is much that is familiar from the original Nord Modular, Clavia have opted for a drastic overhaul with the G2 — most strikingly in the areas of control and performance — and have responded to practically every criticism levelled at the earlier model. There are one or two omissions, but we'll come to those in due course. Before starting, it's important to understand that this is a complex, powerful instrument with over 150 modules currently available. Fortunately, many of these are comparable to those of its predecessor, so it would be helpful to re-read the earlier SOS reviews, starting with the initial two-parter in April and May 1998, and also the later version from July 2000 that brought the Apple Mac into the fold. There are already three types of Nord Modular G2 (see the 'Model Behaviour' box at the end of this article), but this review will concentrate on the G2 — by happy coincidence the version I would have personally requested. This model has a three-octave keyboard with aftertouch and velocity sensitivity (including release velocity), plus Clavia's expressive pitch stick and modulation wheel, as seen on the Nord Lead series. Octave Shift buttons extend the keyboard's range by ±2 octaves when driving the internal sound engine, and in conjunction with the Shift key, this transposition can be applied to externally controlled instruments too. The original Nord Modular communicated with its software editor via a dedicated set of MIDI ports. Not only did this confuse some users (and some MIDI interfaces), but it felt like a workaround awaiting a better solution. Fortunately, that's just what the G2 offers — its USB connection provides all the necessary connectivity with the editor, leaving the MIDI ports to do their traditional thing. There's even a MIDI Thru socket this time! I'm pleased to report that during the review period, I never once lost contact with the modular — and I certainly couldn't say that with the last version (3.03) of the original Modular's editor. The G2 editor only supports one attached Modular — unlike the older editor, which could address up to four. The G2 has a generous four audio inputs, plus a tight-fitting XLR mic Input, complete with built-in preamp and dedicated level control. If used, this XLR connection disables Input 1. Adjacent to these, on the busy rear panel, are four audio outputs. No digital I/O is present, but the 24-bit, 96 kHz A/D and D/A converters do at least give excellent audio quality. The Nord G2's user interface is a vast improvement over that of the original Modular, with its endless encoders and LED collars, and displays above each of the encoders so that the control legending can be changed at any time. Gone from the front panel are the 18 unlabelled knobs and lone two-line LCD of the former Modular. The G2 boasts multiple displays and a panel endowed with rotary encoders and buttons galore. Replacing 18 knobs with eight knobs and some buttons might seem, at first glance, like a poor exchange. However, the G2 borrows a concept seen on such classic instruments as the Oberheim Xpander — a series of small displays above the encoders that change according to the assignment of each encoder. You choose which controls are important and make them available for tweaking on a patch-by-patch basis; the result is that five separate 2x16 displays manage to convey more useful information at a glance than many instruments with a fixed set of controls. In conjunction with a row of Nord-Lead-3-style endless rotary encoders surrounded by a ring of LEDs, you can see up to eight values at any time. Buttons underneath the encoders can quickly toggle values and are ideal for on/off-type functions. Jumping between 'pages' of assigned controls is as quick as hitting buttons; a series of five buttons at the right of the top panel are labelled Osc, LFO, Env, Filter and Effect, and each of these has a further three sets of pages where knob assignments can be stored. When you select a different 'page' of controls, the knobs' LED collars and the LCDs update to reflect their new values. In total, 120 parameters are accessible directly in this way, and this transforms the G2 into a performance instrument par excellence compared with the old Modular. Your knob assignments needn't be confined to those of the button labels either — you are free to assign any control to any page, although it makes sense to use them as far as possible. On the G2, far more actions can be performed without ever needing to switch on your computer. Knob and Morph assignments can be performed directly from the G2 hardware (for more on Morphs, see the box over the page). As before, the complete patch can be edited from the hardware alone; if you press the Patch button (adjacent to the red Store button), the navigation keys will take you around every module, where you can make tweaks, knob assignments, morph assignments and so on. The additional displays give far greater parameter visibility than the old single-LCD version, and editing a patch this way is surprisingly painless. However, what you cannot do is change the modules or cabling — for that you need the software editor, which I'll come to shortly. Normally, the multiple displays show module names and their assigned parameters, with parameter values represented by the position of the lit LED in the encoder ring. By pushing the Display Mode button, you can read the numeric value of the parameter instead, with the parameter name replacing the module name. The G2 architecture includes a built-in arpeggiator and vibrato oscillator plus glide and bend settings. You don't have to use up any modules to enjoy these — they are always present and accessible from the Patch Settings button. The arpeggiator is basic, as we've come to expect from Clavia, but it's great that it's there. Similarly, using the built-in vibrato LFO might be a valuable resource saver. Other Patch Settings include level, the global clock tempo, and the number of voices you've requested for your patch, although as on the previous Modular, whether you get the polyphony you want depends to some extent on the DSP load you place on the G2 when you program it (see the box below). 'Haunted': Various vowel filters are employed in this eerie pad. 'Koto' and 'Acc Guit': These two make good use of the string oscillator. 'BackTo72': A very analogue-sounding solo patch. 'StringVariations': A highly playable collection of solo and ensemble strings. 'G2Padding': A rich, warm pad. 'Trance2_DZLW': Five sequences including synth voices and percussion. 'Alien': A simple but atmospheric patch using stereo delays and reverb. 'Feng Shui': An impressive series of sound effect variations. 'Bells': Deep, realistic bells created by no less than 11 oscillators. 'Arpeggiaperc': An example of the arpeggiator in use (with delay). 'Fat Lead 1': Some lead variations that should cut through pretty much anything. 'Laika': Strummed string oscillators make up this subtle, evocative Performance. 'Beatbox': Another Performance ably demonstrating use of the sequencers and percussion. Sounds are organised into 32 banks of 128 patches. If all these were filled, there would be a total of 4096 patches. However, there is insufficient memory for this number, and the manual suggests that 1200 is a more feasible maximum to expect. Nevertheless, it still makes a lot of sense for the G2 to organise its memory this way, as related patches can be grouped in the same bank for ease of access. You can select patches either by the order in which they are stored, in alphabetical order, or by category (there are 15 to choose from); you use the G2's Shift key in combination with the Down navigation key to toggle the selection criteria. The Up and Down keys then select different banks, the letters of the alphabet with which patch names begin, or categories. Patch selection is made by turning the patch encoder and hitting the Load button when you reach your choice. As on the previous Modular, up to four patches can be running on the G2 at once, each in a memory location that Clavia refer to as a Slot. This means that the G2 is up to four-part multitimbral, as each Slot is able to hold a separate patch running on its own MIDI channel. You can also layer patches by holding down several 'Active Slot' buttons simultaneously. Performances are new to the G2 — and what a welcome addition they are! Finally, a single selection can serve up a complete four-part multitimbral setup. There are 1024 Performances in total, arranged into eight banks of 128. Performance mode is accessed via the button of the same name, and you then make your selection in the same way you do for patches. Splendidly, the four patches in each Performance are not merely references to the main pool of patches — they are memories in their own right. Similarly, knob assignments can be freely made for the entire Performance — so you might create a set of mixer assignments gathering all patch volumes onto adjacent knobs, for example. Just as with patches, memory restrictions may mean you do not have enough space to fill every one of these Performances. Having worked with the previous Nord Modular for some years, I often made collections of patches based on favourite configurations of modules. So how I longed for something like the G2's Patch Variations — of which there are eight in every patch. Each Variation can have unique parameter values, knob assignments, morph settings, and so on. The only restriction is that modules and connections are fixed across all Variations. Nevertheless, this really extracts the maximum mileage out of the patch locations on offer. Variations are accessed by a row of dedicated buttons, by the left and right navigation keys, or via MIDI controller 70, and are stored automatically when the patch is saved. Unlike loading a whole new patch, Variations do not cause the DSP to be recalculated, so you can switch between them far more quickly and smoothly. The G2 is described as 'up to 32-voice polyphonic', but typically, the patches I created in the software editor offered between eight and 10 voices. Once you start to add complexity and/or effects, polyphony can drop to a meagre three voices all too easily! I endeavoured to build a basic 32-voice polyphonic synthesizer with two oscillators, two envelopes, and a filter and mixer section — but as soon as I added even the most basic LFO, polyphony dropped to 28 notes. Adding one of the more complex LFOs (LFOShpA), left me with just 20 voices — and this was before I dabbled with effects or other 'frivolous' modules. In common with the older Modular, the G2 cannot dynamically organise its polyphony. As a patch is loaded into a slot, the synth's entire resources are recalculated, momentarily silencing any output. So to gain greater polyphony, it is wise to deactivate unused slots. This is done using the Shift and Slot keys together. One feature that didn't get ported from the old editor was the floating DSP count that informed you of the processing requirements for each module. This restriction may be due to the fact that many of the G2 modules are self-optimising according to the role they perform, and so no one figure for load can be applied to a given module. The G2 editor therefore requires that you learn a more trial-and-error approach: you become aware of the typical DSP needs of each module by watching the Patch Load section on the Editor's display. Fortunately, swapping one module for another is a doddle courtesy of a pull-down menu available at the top left-hand corner, and all comparable cable connections are remade automatically, which is neat. With practice, and after gleaning tips from the factory patches and excellent on-line user community, I began to discover better ways to use the available resources. For example, in a multitimbral setup, choosing a single slot to provide effects and then routing patches into this slot (via the internal buss system) means the available DSP stretches that bit further. Furthermore, some modules have drop-down menus (such as some of the oscillators) and these use fewer resources compared to those with radio buttons — but the payback is that when you select a new item (such as a waveform) from one of these menus, the G2 goes briefly silent whilst it recalculates the load. There is a theoretical limit of 254 modules per patch — 127 in the Voice Area and 127 in the FX Area, but in practice, you will max out the Patch Load way before you use all of those! The DSP load for the Voice Area part of the patch is represented by the 'VA' box, and that for the FX Area by the 'FX' box. There are separate boxes for Patch Load and Memory but the end result is the same — if either area goes red due to DSP overload, the patch will be muted until you delete some modules. Internally, what has changed? Well, the G2 has RAM set aside for effects such as reverb and a delay of decent length. It has an internal buss system so that signals can be routed internally amongst its four Slot memories and it is also now capable of generating MIDI information from its internal modules — sequencers, LFOs, envelopes and so on. Add in all manner of tweaks to the editor software (which was already a fine working environment) and you can begin to appreciate that Clavia have not been idle. Improvements are still being made. Not all the former modules have been ported over from the first generation of the Modular, and although Clavia have claimed that most will reappear or equivalents will be implemented, work is still in progress as I write this. More seriously, there is no way to import patches from the original, short of manually recreating all your patches by hand — a significant disappointment if you want to upgrade and have a large collection of your own patches. The G2 also doesn't have any sample RAM, so there is no possibility of incorporating short audio samples into oscillators. In my opinion, this would have made the G2 far more 'complete', but Clavia didn't seem terribly keen on the idea when I put it to them, perhaps because the G2 has no means to store samples on board, or perhaps because they have a specific philosophy that precludes the use of samples. But who knows what the future will hold, and whether the DSP currently allocated to reverb and delay could be cunningly reprogrammed to allow a short, volatile sampling capability? After all, we've even seen sampling turn up on some of the latest hardware modulars, such as those from Doepfer and Analogue Systems. Finally, SysEx dumping of Patches and Performances is now a reality — the function is invoked by holding down the Shift and System buttons. The data duly spills from the MIDI Out socket, at which point you can store it in your sequencer and thus ensure the correct sounds are available for each song. This was a feature much requested by owners of the previous Nord Modular. The editor component of the G2 is the front-end software required to create new patches, assemble collections of modules and cable them all together. It requires a PC running Windows 98SE, 2000 or XP and should be at least a 450MHz Pentium II with 64MB of RAM and a USB 1.1 port. This is not terribly demanding by today's standards, and both my main studio PC and my ageing laptop coped with it effortlessly. Installation of both the required USB driver and the Editor went without incident, the first being handled by the usual installation wizard and the second by the installer on Clavia's supplied CD. Incidentally, you can download and install the software yourself if you're interested in seeing what it looks like, even if you don't have the synth present. Once you're up and running, you'll notice that the currently selected patches are loaded into the editor automatically. The patch that is, as Clavia put it, 'in focus' — that is, the one that is ready to edit via the synth's panel — is also 'in focus' in the editor software (note: it is possible to play one patch and edit another if you alter the focus using the Focus/Copy button on the panel). A typical patch in Nord Modular G2 Editor (although note that this screengrab was done on a dual-monitor PC system). The sound-generating modules are cabled together on the left, while the processing modules are situated under the grey bar. On the right you can see the virtual on-screen keyboard and the Parameter Overview module, which is handy for making control assignments on the G2 hardware. There are 15 different module groups accessed via tabs running along the top of the window. Clicking on a tab reveals all the available modules, and holding the mouse over an individual module icon displays it in actual size. To add any particular module to your patch, you either double-click on it or drag it to the position you want on the workspace. You can set up so-called Initial Patches containing favourite modules — although only two of them — so that you can get on quickly with the business of patch construction. This is similar to the concept of Templates on the old Modular, but having just two of them seems rather stingy. In common with v3.0x of the old Modular's editor, the G2 editor's desktop workspace is divided into two areas, Voice and FX, between which you can toggle using the 'V' and 'F' keys on your computer keyboard. The Voice Area comprises the parts of a patch that are common to each voice — oscillators, filters and so on — and typically this is where you would build your main synth. The FX Area, on the lower portion of the screen, features modules that are common to all voices. As you rarely want a separate reverb on every voice of a synthesizer, this is the logical place to build your effects configurations. In practice, the only restriction is that the FX Input module must be placed in the FX Area — otherwise, you are free to build your patch how you like, available DSP permitting, of course. So if you do want a separate effect on every voice of your polyphonic synthesizer, the software won't stop you placing the modules accordingly — but you might not have enough spare processing power for the resultant patch to work! As explained in the 'Polyphony & DSP Usage' box on the previous page, it pays at all times to keep an eye on the Patch Load and Memory boxes while constructing a patch — these show the overall DSP allocation. Modules can now be coloured in a fixed selection of rather fetching, pastel hues. This is handier than it may seem, particularly in speeding up navigation through busy patches. Many modules have on/off controls that are invaluable for programming, as they effectively deactivate the module but maintain its connections. Of the other editor features, the Parameter Overview window deserves special mention — not least because it is the slickest method to assign the G2's physical controls. Using drag-and-drop techniques, this menu offers the speediest way imaginable to assign and view all 120 parameters. If you want to record parameter tweaks to an external device or sequencer, the neatest way is with the Auto Assign MIDI Controllers function. This is far neater than individually assigning a MIDI controller to each knob, although this is still possible by right-clicking on the on-screen controls. In the next version of the editor software, this feature is apparently due to be improved still further — the plan is to incorporate it into the Parameter Overview window. I won't assault your senses by attempting to describe each and every module. Instead, I will list each group in turn, and then cherry-pick, with special emphasis on the most interesting new arrivals. Morphs are a much-loved Clavia feature intended for use in tweaking multiple parameters simultaneously over pre-programmed ranges and in pre-determined directions. There are now eight morph groups available — the sources (Mod Wheel, Keyboard, Aftertouch, Velocity, and so on) are listed underneath the Variation buttons. Morphs can control a maximum of 25 patch parameters. In keeping with the improved user interface of the new modular, morph assignments can be made on the hardware as well as in the software editor. The Morph button transforms the Variation buttons into Morph Source selection controls, at which point you hold down the relevant button and turn an encoder to set the assignment. These modules (2 Output, 4 Output, 2 Input, 4 Input, FX In, Keyboard Voice, Keyboard Mono, Device, Status, Note Detect, and Name) contain the I/O routing for audio and MIDI control signal inputs. In the G2, the physical inputs and outputs are no longer the only means of accessing audio. Clavia have provided a much-requested feature — a four-channel internal audio buss with which you can route signals from one slot to another. This is present on each of the Input/Output modules. The FX In module is equivalent to the old Poly Area In module. It is used to route the output of the Voice area to the FX area of a patch. Particularly worthy of note in this section is the MonoKey module, offering Last, Low and High note outputs. This is far more flexible for solo patches than the old Nord Modular, which featured only last-note priority. The Device module presents a series of outputs from the performance controllers, such as the mod wheel, aftertouch, and so on. Despite having just three outputs, the Status module is enormously useful. Its first output socket, Patch Active, emits a logic signal when a patch is loaded into a slot; you could use this to trigger an action such as starting a sequencer. The Var Active output produces a logic signal when a Variation is activated, and can be used in a similar way. But the most interesting is the Voice Output module, which generates a control signal corresponding to the voice number currently played. There are several modules that make use of this function specifically, such as the Multiplexer and the Control Sequencer, and the manual offers examples where these modules are used together to produce polyphonic patches in which each note has its own detune setting or waveform. Thus you can create the kind of subtle effects previously heard on synths such as the Oberheim Four-Voice, where each voice was a completely separate synthesizer. The G2 method is far easier and quicker! Finally, there is the Name Bar — a floating text box used to add documention to your patch, describe the Variations or to present information in the display windows. The Note Group contains various pitch-related modules (Note Quantiser, Key Quantiser, Partial Quantiser, Note Scaler, Glide, Pitch Tracker, Zero Crossing Counter, and Level Scaler). The first few I'll describe aren't actually new, but when combined with others — especially the MIDI Out modules — they become more useful than previously. The Note Quantiser module takes a continuous signal and renders it into semitone steps. So an LFO could be used to generate glissando effects, for example. The Key Quantiser goes one step further; send it a range of notes and it will output notes that are confined to a specific key. A small keyboard display is used to determine the notes that will be permitted. The Partial Quantiser requires either a very short or very long explanation, but it is far more versatile than the manual's brief entry suggests. It is a control signal processor that can be used to step through an oscillator's harmonics a partial at a time, and thus create glissando or arpeggio-type effects. You can even feed the module negative control signals, thereby stepping through undertones of your oscillator's output, ie. harmonics at fractions of the oscillator's fundamental frequency. Pitch Track and ZeroCnt are modules that extract the pitch from an input signal. They function rather like the Korg MS20's Frequency-to-Voltage converter, and are equally difficult to obtain precise results from, but they're fun all the same. With clear, monophonic signals the results can be quite useable — anything else tends to produce warbly bagpipe impersonations. This group of oscillators (specifically oscillators A, B, C, and D, the Phase Modulation oscillator, Shape oscillators A and B, and the Dual, String, Percussion, Noise and Master oscillators, as well as a complete drum synth module) contains the G2's main sound sources. Some of these conform, more or less, to those of a traditional well-stocked analogue modular, but there are also several less conventional inclusions. The module offering a bank of sine waves featured on the original Modular is missing, and Clavia reveal that two of the modules documented in the manual are not yet present either — which is a shame, as these will place the voice structure of a DX7 inside the G2, complete with 32 FM algorithms and Operator controls. I had a brief preview of beta versions of these modules and they look impressive, but weren't sufficiently finished at the time of this review to form any definitive conclusions. The oscillators can receive pitch from the keyboard without requiring any patch connections but, if you wish, deactivating the Kbt (Keyboard Tracking) button removes this internal connection. All expected 'analogue' waveforms are present, plus several variants. Oscillator B features a double sawtooth wave. The shape of this can be altered using either a knob or the modulation input; the two sawtooth waves then shift their phase relative to each other, producing a warm, swimmy effect. The Phase Modulation oscillator produces FM-like tones, whereas the Shape Oscillators also feature a host of waveforms whose shape can be modulated. Sometimes this produces effects similar to filtering, while at other times, harder, harmonically rich timbres emerge. These modules replace the first-generation Modular's Spectral Oscillator, and have more waveforms. The Dual Oscillator produces two simultaneous waveforms plus a sub-oscillator. You can modulate the pulse width of the square wave and the phase of the sawtooth — so this is a pretty fat-sounding module even before you mix in the sub-oscillator! The latter's 'soft' setting reduces the harmonic content as if a low-pass filter had been applied. Surely the most interesting member of this group is the String Oscillator. This module is actually a pitch-controlled delay line with feedback. It needs to be 'excited' by an input signal, and will then produce tones that vary depending on the signal chosen. I found bursts of pink noise or short, percussive sources were good starting points for creating realistic plucked-string tones. The decay parameter sets the time of the internal feedback signal and the damp parameter governs high-frequency damping. Some of the factory patches, such as the kotos and acoustic and bass guitars, ably demonstrate the quality of this module. The LFO modules (LFO A, B, and C, Shape LFO A, Clock Generator) are fairly self-explanatory and this time around, MIDI Clock synchronisation is available to three of them — LFOA, LFOB and ShpA. The LFO section also contains the Clock Generator, but lacks the random modules and the Pattern Generator of the earlier Modular. The various envelope types (ADSR, Hold, Decay, AD/R, AHD, ADDSR, Multi Stage, AHD-Mod, and ADSR-Mod) behave as you'd expect from their names, so there's no need for lengthy explanations here. Their output signal polarity and shape are set by clicking on the small Type and Shape buttons, giving bi-polar envelopes, inverted envelopes and exponential or linear curves for different envelope stages. In common with the oscillators and LFOs, the envelopes have a pre-wired connection for ease of use; they are triggered when you play a key or when MIDI notes are received (assuming the 'Kb' button on the module is active). The Shaper group of modules (Clip, Overdrive, Saturation, Exp Shaper, Wavewrapper, Static Shaper, Rectifier, and Shaper) includes various sound-shapers that are familiar from the first-generation Modular. For example, there's Clip, which produces digital distortion, Overdrive for a warmer distortion, and Wavewrapper, for those FM-like distortions full of overtones. Clavia have announced a Voice Expansion board for the G2 which doubles its polyphony, although it was not available at the time of this review. The Expansion board features four extra DSPs and RAM circuits and is user-installable. It is also compatible with the new rackmount Nord Modular G2 Engine. What's more, by the time you read this, the Mac OS X version of the editor should be well on the way. It will work in the same way as the Windows version, using USB for connectivity, and should be available for free at www.clavia.se. I was lucky enough to see details of some forthcoming modules during this review; these include pitch-shifters, random LFOs, a MIDI automation module, a new noise source and DX7-style FM modules. If the long development life of the previous Nord Modular is anything to go by, there will be plenty more to come. The familiar Nord sound comes from the combination of its bright, clear oscillators and its distinctive filters. There are many types in the Filter group of modules: Low-pass, High-pass (each with adjustable slopes ranging from six to 36dB per octave), the Nord and Classic filter modules, a multi-mode filter, and a static 12dB-per-octave type, as well as a wah-wah, voice filter, vocoder, simple two and three-band EQs, and a comb filter, amongst others. Many of these are the same as they were on the original Modular, or have only received small tweaks, and the old fixed filter bank has been dropped altogether. The wah-wah and comb filters are new, the latter offering adjustable distance between its peaks and notches, and adjustable feedback. As filters are so integral to a synth's character, I must say that I'd have hoped for more advances in this group. The Mixer group offers a total of 12 mixers of various types, ranging from one to eight channels. There are mixers with sliders or attenuator knobs, plus pan and crossfade modules. The G2 doesn't differentiate between control and audio mixers — it adapts intelligently according to the signals present. The inputs and outputs even change colour to reflect the signal carried — red for audio, blue for control signals. As on the previous Nord Modular, internal audio signals have the highest priority, and are sampled at 96Hz. Control signals are sampled at 24kHz, so the DSP patch load is lower for mixers that do not carry audio. The primary function of switches is to make or break connections in a controllable way. The G2's Switch group contains various Switch modules, including momentary, toggling and value switches, all of which operate depending on the level of input control signals. There are also Sample & Hold and Track & Hold modules. If a switch has a label box, right-clicking on the box offers a 'name' option, which can be used to add text that will be meaningful in the G2's display. So if you set up a switch with four inputs as a selector for modulation sources, you could name the sources 'LFO1', 'LFO2', 'Env', 'Vel', and so on. This is yet another small but valuable interface improvement. The Window switch is highly versatile; it makes a connection and simultaneously sends a logic signal whenever an incoming control value falls between the From/To settings specified. The Multiplexer is another fun module, routing a selection of inputs to outputs (or, indeed, a selection of outputs to inputs). Its connections are determined on receipt of specific control signals at its 'Ctrl' input. Like Switches, the Level group of modules isn't particularly glamorous, yet its constituents are vital components in any modular system, performing various transform functions on signal level. Amongst the included modules are types for adding, amplfying, multiplying and modulating the level of input signals, as well as a noise gate and envelope follower. There's also a group of Logic modules, including a Logic Gate, Inverter, Binary counter, and eight-bit A-D and D-A converters. These all have simple high or low states (corresponding to +64 or 0 values in their input signals). For more on how such binary-driven logic systems work, see Synth Secrets April 2004. The rear panel of the G2 is also improved over that of the original Nord Modular — there are two extra audio inputs, a dedicated XLR mic input, and a MIDI Thru. Best of all, the interaction with the G2 editing software is now handled via the USB socket, rather than by the former Modular's confusing second pair of five-pin MIDI connections. Five different sequencers (Event, Value, Level, Note, and Control types), each with a maximum of 16 steps, are used to provide loop and pattern-based material of all kinds. If you need more than 16 steps, sequencers can be chained together. In such cases, the gate and control signal inputs are used to merge their outputs, and thus avoid the need for a mixer. The Park input is new; when a high logic signal is received at this input, the sequencer will stop. And if a high logic signal is received at the Reset inputs, the sequencer will restart at step one on receipt of the next clock pulse. The sequencers are very similar to those of the previous Nord Modular, and I'd have welcomed more features, such as a direction switch, the option of Morphing the length of a sequence, or the inclusion of a Step Skip option (as seen on old Moog or ARP sequencers). Yet with innovative application of what's on offer, you can still create marvellous, complex patterns. When you assign Note Sequencer modules for control via the G2 encoders, you can see each step's actual note value on screen. The buttons underneath are used to toggle the on/off status of steps whilst LEDs adjacent to the knobs follow the sequence progression. The Control Sequencer is particularly interesting, in that its next step is determined by the values of incoming control signals, rather than by a conventional clock pulse. To step this module forwards, you send a rising sawtooth waveform to the control input, while a falling waveform steps it backwards. Additionally, the module's Xfade button slews the output between steps, smoothing the transitions. This group comprises a straightforward selection of effects modules (Stereo Chorus, Phaser, Flanger, Digitiser, Frequency Shifter, Reverb, and Compressor). The Digitiser module can reduce the sample rate right down to 32Hz, and can be modulated via a control source. Quantisation can be adjusted between one and 12 bits or 'off', which means full resolution (24 bits). If you want dirt and grunge with minimum effort, this is for you. The Frequency Shifter performs additive frequency shifts (unlike conventional pitch-shifters, which perform multiplicative frequency shifts) like the Bode units seen in Moog and Analogue Systems modular systems. It produces audible effects not unlike those of a ring modulator; used sparingly, these can add considerable richness or exciter-type effects to a signal. The Stereo Reverb module is a pleasant surprise. I was starting to think Clavia would never put reverb into a synth, but thank heavens they have — even if the quality is unlikely to give Lexicon any sleepless nights, this is a secondary consideration in the context of the G2. Reverb in a modular system offers far more than just a glossy finish, because you can place it anywhere in your synth's architecture — an option you don't have with an external unit. Small, Medium, Large and Hall types are on offer, with a maximum time of over 17 seconds. A Dry/Wet level and a Brightness control are the remaining options. Marvellous — a whole group of modules devoted to delay, with many types (Static Delay, Single Delay, 2 Tap, 4 Tap, 8 Tap, Shift Register, Clocked Delay, Delay A, Delay B, and Stereo Delay). Clavia have sensibly provided a range selector to help conserve the available RAM, and the maximum delay time is 2.7 seconds. The delay modules range from single delays to eight-tap and stereo delays. MIDI sync is available, but if you're clocking the G2 from an external source, you need to ensure you have a very stable MIDI Clock source. The delays do not respond well if you tweak their time parameters during playback, either from a front-panel control or (if sync'ed externally) from the glitches of an unstable MIDI Clock. In fact, some of these 'adjustment' noises are quite unpleasant, so I hope Clavia will add some kind of intelligent smoothing in the future. Several unusual delay modules are present, such as the Delay Shift Register. This has eight outputs and shifts the incoming delayed material through successive outputs on every clock pulse. The Clocked Delay Register works in a similar fashion, except it has only a single output and you specify the number of clock pulses after which the value signal will be output. As well as the G2 keyboard reviewed here, Clavia also offer the so-called G2 Engine — a 1U rack unit device with all the processing power of the G2 but none of the controls. It is significantly cheaper, but effectively ties you to a computer and MIDI controller or master keyboard setup. The most recent addition to the range, the G2X (announced at the recent Frankfurt Musikmesse, but not available at the time of writing) will offer a five-octave velocity- and aftertouch-sensitive keyboard, and double the polyphony of the standard G2. This last feature is available courtesy of a Voice Expansion board that will be fitted as standard on the G2X (it's an optional add-on for the G2 and Engine). The G2X will also offer two additional assignable modulation wheels with position LEDs, and a gooseneck XLR microphone will be included in the package. Thanks to Rob Hordijk — Nord Modular guru — for his invaluable advice during this review. At last, the module group we've all been waiting for — or I have, anyway. This group contains modules that control the receipt and transmission of MIDI data (MIDI Ctrl/Prg/Note Send & Receive, and MIDI Note Zone). In an analogue modular system, you can easily connect the output of an LFO to a variety of other instruments — all it takes is a voltage input and a cable. But how can you connect the LFO inside a MIDI synthesizer to an external instrument? With the G2, you can! The Control Send module can transmit MIDI controller information on a specific MIDI channel. So why is this such a good thing? Well, not only can you transmit MIDI information from the MIDI Out socket of the G2, you can also route the information to any of the four G2's slots (A-D) — or to the 'This' setting, which routes the data back into the current slot. If your curiosity is still not piqued, imagine you've programmed a morph to sweep the cutoff frequency, alter an envelope attack time, fade in some noise, brighten the reverb, or modify a wave shape. All of these changes can be controlled by a single source, such as the modulation wheel. But now imagine you directed the output of an LFO into a Control Send module, simulating mod wheel events and routing them back into the current Slot — you see where I'm going? Suddenly, the LFO is capable of controlling the morph automatically. If nothing else, it generates a lovely display of moving, flashing lights on the already impressive panel, but it also opens up an exciting world of evolving patches. And because you can control morphs with the LFO in this way, you can affect parameters for which there may not even be control signal inputs. Another idea that occurred to me was to route the output of an LFO to generate MIDI Controller 70, which, you may recall, is used to select Variations. It could then switch Variations automatically whilst you play. The Note Send module works in the same way, transmitting note and velocity information. Connect several sequencers to Note Send modules, assign the G2's knobs to set the note values, and in no time at all, you have assembled a sequencer of awesome flexibility. Mix in some notes generated from an LFO or Sample & Hold module (routed through that old favourite, the Note Quantiser, to make sure everything remains in key) and you can create patterns of amazing subtlety and complexity. I hope that these simple examples demonstrate the usefulness of the MIDI output modules. As is probably evident, this is the kind of stuff I just love to explore. Clavia's first modular is a hard act to follow. The G2 falls into the category of 'logical progression' rather than 'revolutionary creation', but there are encouraging signs of what is still to come. Certainly, the inclusion of acoustic modelling is a move in the right direction; the string oscillator sounds great, and I look forward to further, more unusual, sound sources. Perhaps, if sampling really is a no-no, resynthesis or granular synthesis modules may one day appear. With its DSP effects, MIDI Output modules and the enhancements to performance controls and its user interface, the G2 must surely fulfil most of the wishes of original Nord Modular owners. Yes, we'd love more polyphony and yes, we'd love some radically twisted new modules; yes again, we'd like it for less money, but hey, how many kidneys do you actually need? And if budgets are tight, there is always the much cheaper Engine version as an option. The main difference between the G2 and a hardware modular is that the former is essentially a closed system; if you want to add a module that does something Clavia don't provide, you can't simply cable up a module from another manufacturer. Likewise, when Clavia finally move on to developing for a replacement hardware product, users will have to accept that further improvements to this system are likely to cease (as they have for the original Nord Modular). In the light of this, it is unfortunate there is no way to import patches from the older modular. If you have invested a lot of effort programming for that platform, it may not be quite as tempting to upgrade and start again from scratch. This time around, Clavia have concentrated on making the player's modular — the underlying concepts are broadly unchanged. Sure, new modules and functions have been added, but mostly it is the ease of use that has increased dramatically. Perhaps this will banish some of the fear that the more inscrutable first generation inspired. I found that, once it's configured to taste, you can do a hell of a lot using the G2 as a stand-alone instrument — and when you do need to delve deeper, the editor is excellent. I'd hate to think of a future where the most thrilling instruments arrive on a CD and require a computer to give them a voice. I believe Clavia have done a great job with the G2, and maybe one day it will be remembered as an important stage in a hardware renaissance. I already know several musicians who are quietly advertising their grandmothers on eBay in order to afford a G2. If you want to get deep into complex synthesis, but prefer to perform laptop-free, the G2 could be the answer to your prayers — if not to Granny's. Great new modules, including DSP effects, acoustic modelling and MIDI Out! More stand-alone accessibility than its predecessor. Combines the interface and programming potential of a software synth with the portability and performance of a hardware instrument. More memory locations; can store complete multitimbral setups. Limited polyphony a frequent problem in many patches — that forthcoming voice expansion might be necessary if polyphony is an important purchase factor. No sample RAM — a missed opportunity in my book. Doesn't import patches from the original Nord Modular. The G2 is currently still missing some useful modules from the original Modular. A remarkable synthesizer in terms of programming potential, accessibility, configurability and versatility. There are more 'ilities' I could add, but you get the picture. If you're an adventurous sound designer, or if you prefer to trust hardware for live performance, or both, the G2 is a dream come true. Clavia Nord Modular G2, £1595; G2X, £TBC (but expected to be in the region of £2200); G2 Engine £795; Voice Expansion option £295. Prices include VAT. Hand In Hand +44 (0)1579 326155.